Tan Lin and Robert Fitterman are two of the most significant experimental writers of their generation. Both work extensively with found materials and with the language of the Internet. 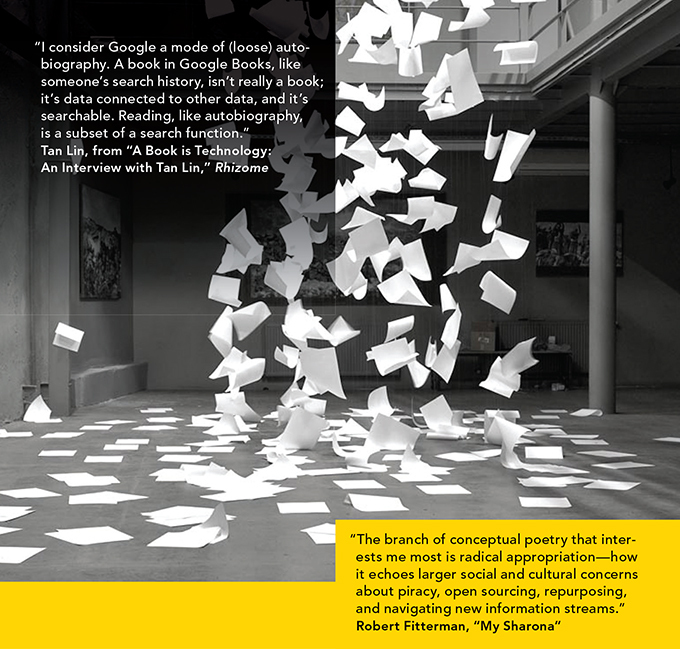 They will be introduced by Paul Stephens, who writes about Lin and Fitterman in his new book, The Poetics of Information Overload: From Gertrude Stein to Conceptual Writing. Poet, novelist, filmmaker, and new media artist Tan Lin draws on and samples source material from popular culture and the Internet to address issues involving copyright, plagiarism, and technology. He is the author of thirteen books, most recently the novel Insomnia and the Aunt, and the poetry collection Seven Controlled Vocabularies and Obituary 2004: The Joy of Cooking. Robert Fitterman is the author of numerous collections of poetry, including No, Wait. Yep. Definitely Still Hate Myself, Holocaust Museum, Now We Are Friends, and Rob the Plagiarist. He teaches writing and poetry at New York University and the Milton Avery Graduate School of the Arts at Bard College. Paul Stephens has taught at Bard College, Emory University, and Columbia University. He edits the journal Convolution and lives in New York City.